The Mason jar is exactly what’s needed to shake up your lunchtime or picnic routine. Not just a portable container, salads are layered in a strategic way in the jar for lasting crunch power. Either make the Mason Jar Taco Salad packed with a spice-rich dressing over veggies galore and kidney beans, or use the guidelines below to concoct your own Mason jar salad creation. 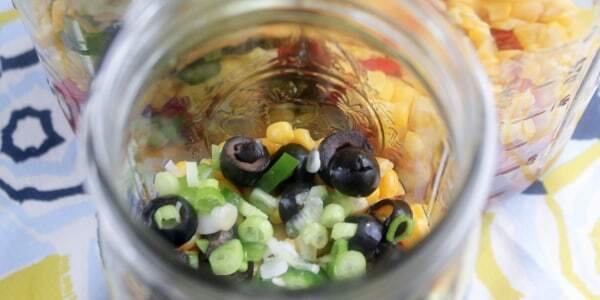 If possible, use a wide-mouth Mason jar because it’s easier to get the ingredients both in and out of the jar. A quart Mason jar is good for a salad packed with tons of vegetables. If you’re going heavy on the grains and protein, a pint-size jar may be the perfect amount for a lunch. Experiment to see what works best for you. Anything that needs to stay crunchy goes directly on top of the lettuce. Either place right on the lettuce or for extra assurance of crunch, place in a small sealed Ziploc bag on the top. Food that turns brown like diced apples or avocados should be doused with lemon juice to delay the browning. An all-vegetable Mason jar salad can keep in the fridge for 4 days. If you do add meat (like chicken, ham, tuna, or salmon), try to eat within a day or two or add them to the top of the Mason jar the morning of use. To use, simply shake the jar so the salad dressing is incorporated throughout the salad. If the salad is packed too much for the shaking to accomplish anything, eat a few bites, cover with the lid and shake again. Pour into a bowl to devour or eat from the Mason jar itself.